Used Portable Trade Show Displays? Buying used portable trade show displays that are in good condition and easily adaptable to your product graphics can save you thousands of dollars in exhibit costs. In some cases you can reduce your expenses by 50% or more. You can source used exhibits through display and exhibit companies, booth design firms, social media and exhibiting sites, professional associations, and auction sites like eBay. 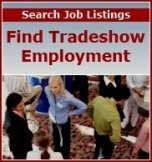 Also, check online and print classified advertising in trade and association journals to look for companies interested in selling their used portable trade show displays. Pop-up Exhibits: These portable booths "pop-up" into a full-sized exhibit and feature strong graphic images as a backdrop to your booth. Panel Exhibits: Exhibits that fold up into portable panels can be used effectively for displaying products you are trying to promote while offering convenient portability. Table-top Exhibits: These displays feature fold-out panel systems that sit on a table or other platform. They are excellent if you are traveling and exhibiting at many small fairs and shows. Large Custom Displays: Designed to showcase products, sometimes as large as vehicles, at major shows, these custom exhibits are constructed with a variety of product materials and come in all types and configurations based on the purpose they are designed to serve. In addition to buying a pre-owned exhibit, you can find used accessories for your booth, including podiums, counters, display cases, shelving, lighting, chairs and work stations. When you buy used exhibits, you will need to work with a designer or display firm to customize your new purchase with your company logo, graphics, colors and signage. If you buy from a display company, often there are in-house graphic and design services that are available to you. You can even negotiate customization work with your booth purchase price. Before you make your purchase decision, assemble the booth yourself and make sure everything works properly. Carefully review the appearance, overall quality, and wear-and-tear on materials. Afterall, the display must effectively portray your company image. Make sure the used exhibit you are considering can effectively be adapted to your needs and strongly convey your product image and message.